Dinner two nights ago was the Mexican beans and rice variation from Beans and Rice 5 Ways at No Meat Athlete. I just love these recipes. They are so simple and good for you! I didn’t have pinto beans so I used black beans instead. I also didn’t have a lime or cilantro so I just left them out. I did add a sliced avocado and some tortilla chips. The tomatoes and green chilies makes this a little spicy which is fun. Overall two thumbs up. 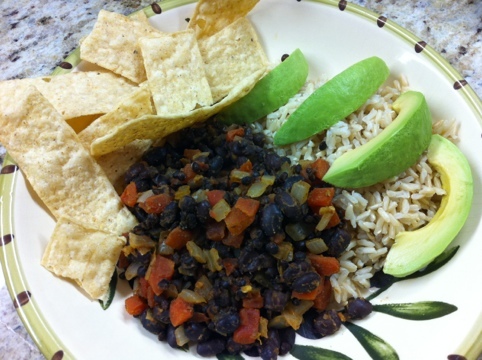 So far I have tried the Mexican, Baltimorean and Asian rice and beans varieties. I still need to try the Mediterranean and Indian recipes.